Many brides choose Bali as their wedding destination because of the countless spectacular wedding venues available in Bali. In fact, there is no other place in the world which offers such a staggering array of beautiful venues to celebrate your big day in style. 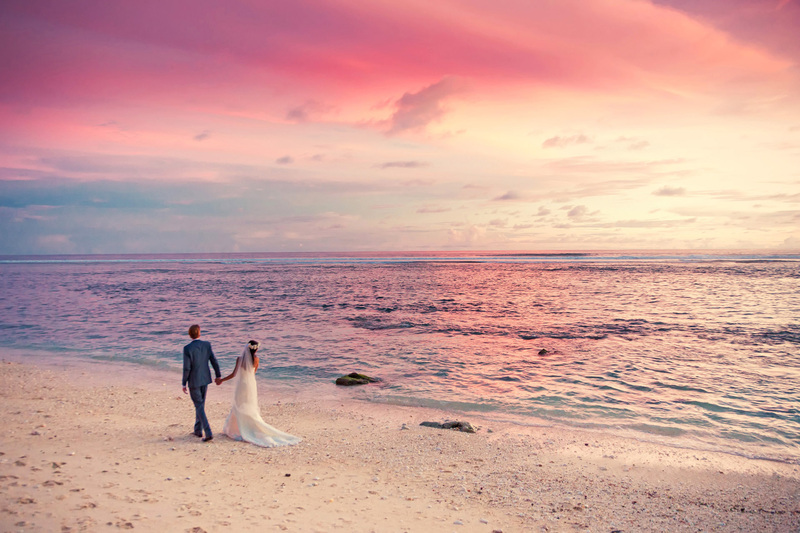 Weddings in tropical gardens, on white sand beaches, beautiful glass chapels and and and… Bali has it all. 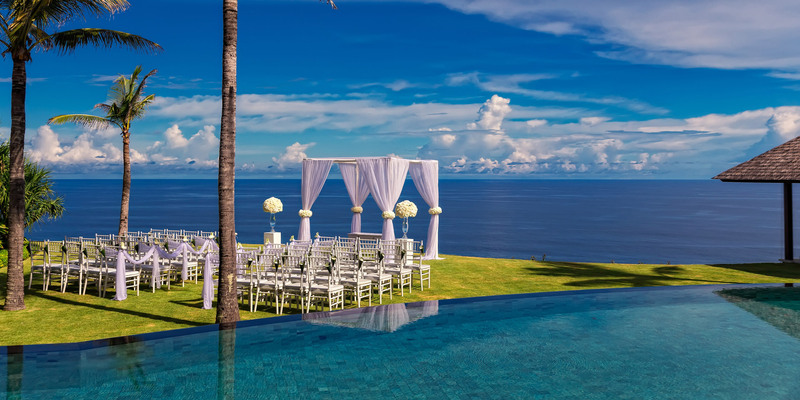 Among all those lovely wedding venues Bali’s clifftop villas are probably the ones with the biggest wow-factor. Breathtaking, jaw-dropping, awe-inspiring are just a few of the words that come to mind. Who needs much decoration when you have view like this ? Are you getting excited my Dears ? Let’s see some more to savor your wedding taste buds. Ready for Mr. & Mrs. 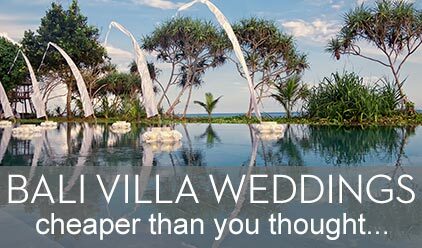 I know you are now all fired-up to discover which are the best and most popular clifftop wedding villas in Bali. So let’s dig straight in. 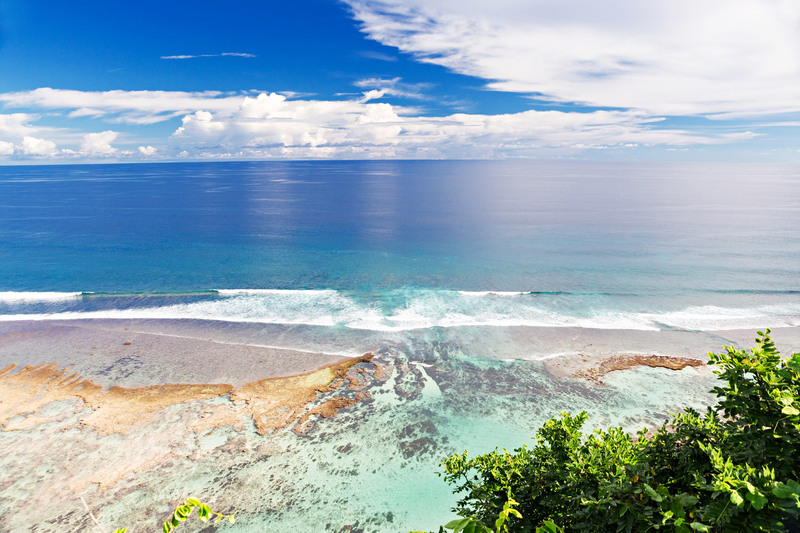 Most, if not all popular cliff-top villas in Bali are located in the very South of Bali — the Bukit region. You may ask why all cliff top villas are there and none in other areas. The answer is surprisingly simple: Because that is the only area in Bali which has those spectacular high cliffs overlooking the ocean. Other seaside regions in Bali are mostly on flat beaches. One of the advantages of cliff top villas being in the Bukit area is: it’s close to Nusa Dua, which has a huge selection of hotels and resorts where your guests can stay. 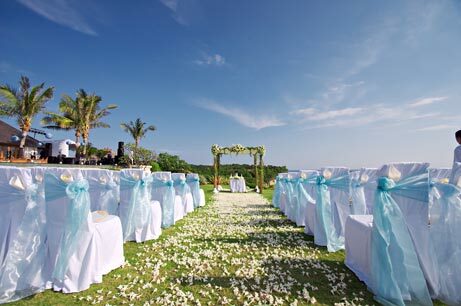 Driving time between Nusa Dua and the areas where the clifftop villa weddings are is usually under 30 minutes. Making it convenient for your guests. Below please find a map of the area where almost all of the popular clifftop wedding villas in Bali are located in Bali. 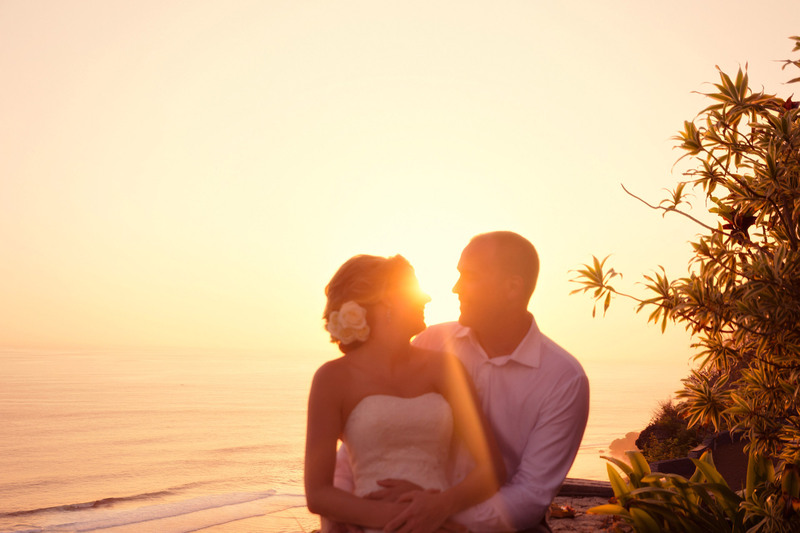 Which are the best clifftop wedding villas in Bali? Before we look at the answer to this burning question let’s see some more images first, shall we ? 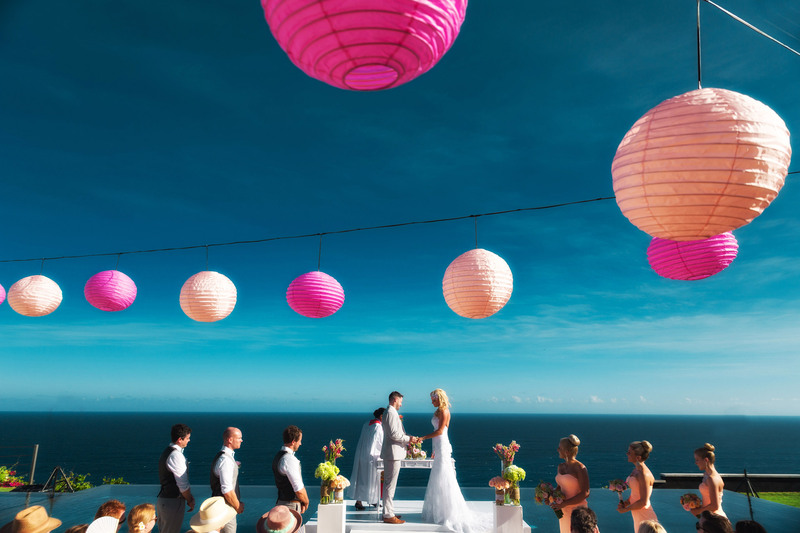 Are you in for a clifftop villa wedding in Bali ? Yes, I know that is your most burning question and the reason why you are still reading this. And the answer to that question may not be what you were hoping for. Why ? Let me give you an example to illustrate my point: Some couples want the villa only for a day or two and don’t care much about the rooms in the villa because they actually rent the villa for the wedding event only. Whereas other couples will spend a few days in the villa with either their families and/or best friends. For those couples the amount of rooms and size of rooms and the villa’s facilities are important. Or some couples are perfectly happy for their reception dinner to go only until 22.00 h or 23.00 h.
Others would not consider any villa that does not allow them to party hard until very late — well past midnight. Which rules out many villas that may otherwise be perfect. 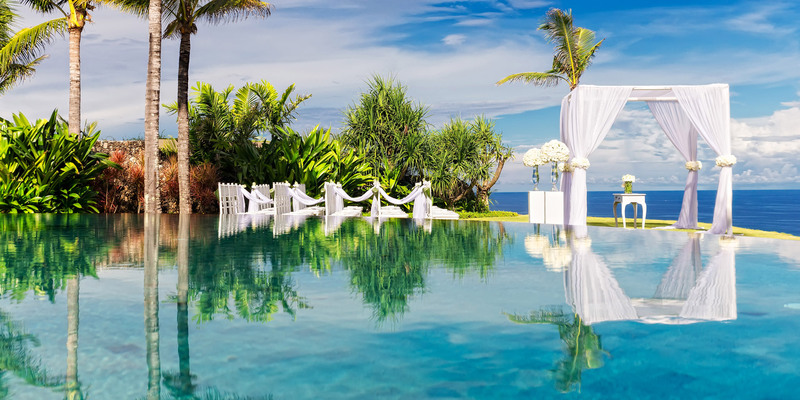 Therefore, it is mandatory that you talk to a good Bali wedding planner who can explain the differences and can find the best clifftop wedding villas in Bali for your individual requirements. A villa that suits your budget and taste. I value your time. 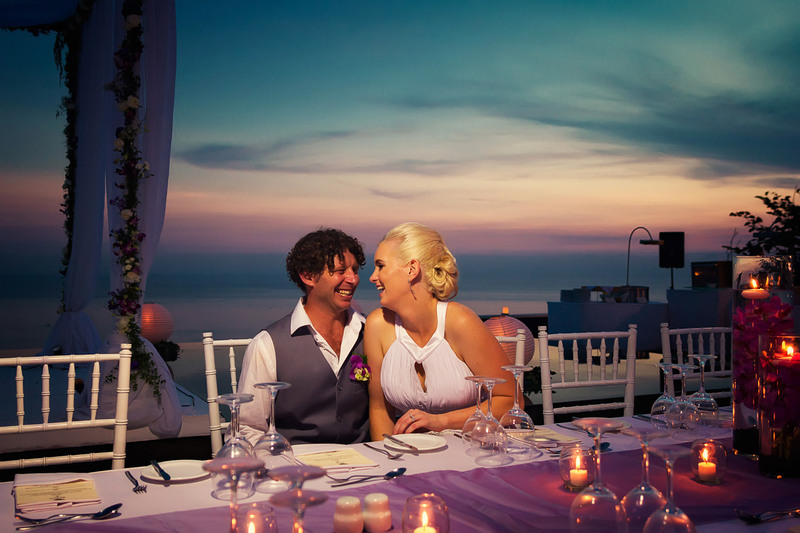 Therefore, we should look into the cost of a wedding in a Bali clifftop villa first. Because there is no point in exploring this option further if you have an insufficient budget or unrealistic expectations when comes to the cost of your Bali villa wedding. First things first. Clifftop villas are generally more expensive than other villas which do not offer such grand vistas. However, the good news is that the price difference is not too significant. In your total budget the difference may be only a couple of percent points of the total budget required for your wedding. So how much do they cost, I hear you ask. Generally, those large clifftop villas in Bali cost between 800–2000 USD per night to rent. But to have a wedding in such a villa there are some other costs to be considered. You need to understand most of those villas need to be rented for at least 3 nights. During high season some even require you to rent the villa for 5 nights. There are a handful of villas that allow you to rent only for one day. And all this quickly adds up. Finally ladies: As a very, very rough estimation you should budget at least 15.000 US$ for a cliff-top villa wedding including all that is required. And that is for a wedding with 15–30 guests only. If you wanna go posh on decor, vendors, catering and inclusion then better have at least 20.000 US$. But again, don’t nail me on this figure because there are many variables that will influence the price you will have to pay in the end. a.) How many people can stay / sleep in a given villa. Or in other words how many bed rooms does the villa have. b.) How many guests can the villa accommodate for the wedding ceremony and the reception dinner. Let’s look at the answers to those two questions one by one. Most villas have 3 or 4 bedrooms. They can conveniently accommodate 6–10 guests. Often the rooms are so spacious that it is easy to put in additional beds. For instance if your sister and her two kids were to stay with you in the villa and they don’t mind to stay with their child in one bedroom that is for most villas no problem. There are very few villas that have less than 3 bedrooms. And on the larger side few villas have more than 6 bedrooms. There may be a few that have 6 and more rooms, but those are rare and far in between. So if you were hoping that all your 30,40 or even more guests will stay with you in the villa I am afraid that wont be possible. Because no such villas or villa compounds exist. But that is not really a problem because as I mentioned before there are usually many hotel options close by for your guests. We talked about views, didn’t we ? As for the 2nd question about how many guests the villa can accommodate for the ceremony: All villas will have no problem to accommodate 30,40 up to 50 guests. Most are even larger. They have no problem with up to 100 guests. Choices become limited again if you plan on having over 100 guests. And very few villas will be able to host over 200 guests. So at average, most cliff top villa venues will be good for 20–80 guests. What about less than 20 guests ? 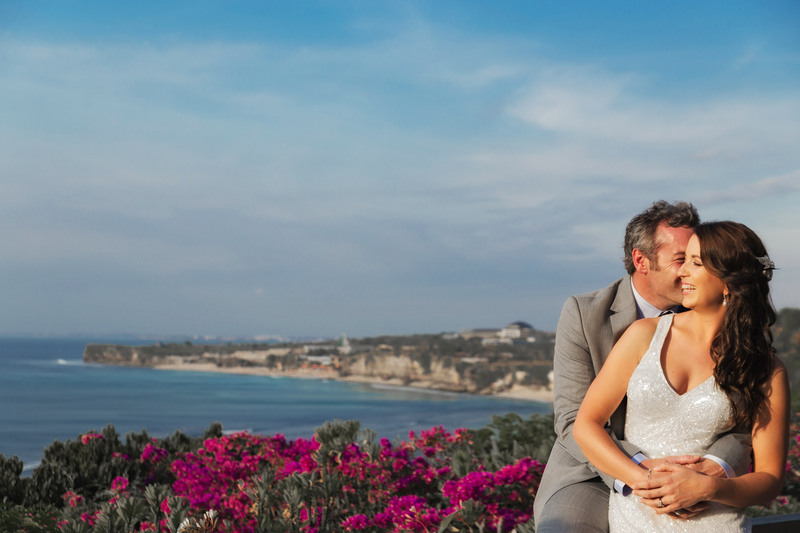 You can certainly host your small, intimate wedding or even an elopement wedding in a cliff top wedding venue. However, as mentioned before there very few small cliff top villas. Therefore, the cost may be a limiting factor. What about plan B ? Or better call it Plan R . 'R' as in rain. The good news is that during the dry season the probability of rain is rather small. However, even during the dry season there can be days with rain. During rainy season rain usually comes in the form of short intensive showers. After which the sun comes out again quickly. However, there are days in Bali where it rains the whole day or days with lots of rain. And you should definitely be prepared for this. Some villas have extra large living rooms or verandas. So it may be possible to hold the ceremony and the reception dinner under a roof. But such covered areas usually can only accommodate up to 20, 30 guests. For weddings with over 30 or 40 guest you will need to prepare for eventualities. For larger weddings you may want to rent a tent. The challenge with tents is that they need to be pre-ordered and paid for regardless if you end up using it or not. And most of those tents require between 2 to 4 hours to set up. Choose your wedding planner wisely !! For a villa wedding you need not just any planner, but a seasoned planner with plenty of experience with villa weddings. You should make it a condition that your chosen planner has worked on previous weddings in the villa where your wedding will be held. There is nothing worse than having one of Bali’s countless wanna-be planners ruin your day with a badly coordinated event. And a stressed out bride. 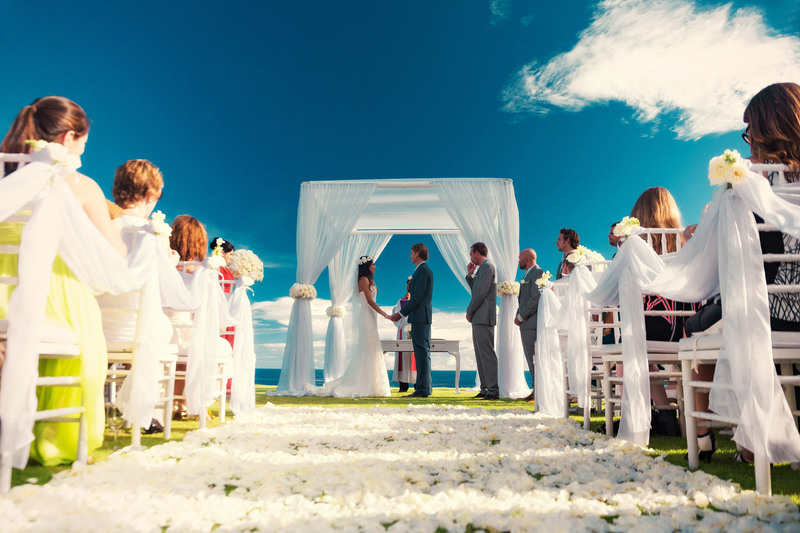 Keep in mind: Usually, there are between 6–9 different vendors / service providers involved in a typical villa wedding. And it needs the coordination of an experienced planner to make all of them work in concert. Needless to say that your chosen planner should a member of the SOCIETY OF BALI WEDDING PROFESSIONALS. If you want me to recommend the ideal wedding planner for your wedding please let me know. I’d be very happy to help. Isn’t it cheaper to go directly to a villa and not have a wedding planner ? In most cases, it is not. In fact, there are plenty of cases where it turned out that booking the wedding directly with a villa was more costly than if an independent planner would have been involved right from the start. Generally, villas do not have their own wedding planner or wedding department. Remember those are holiday villas. Therefore, they outsource the wedding planning, the coordination on the day and other aspects to a planner. Many couples had learned the hard way that the planner which was appointed by the villa for them turned out to be more costly. Or worse brides ended up with one of Bali’s countless ‘lemons’ as their planner. 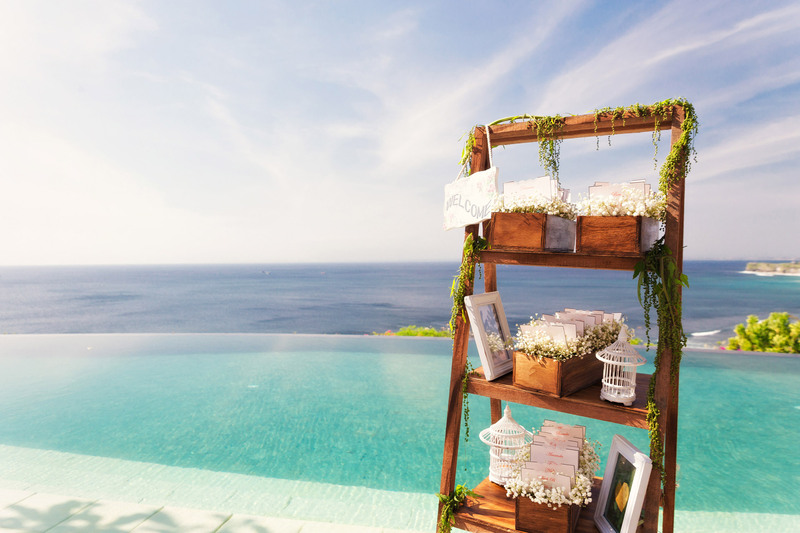 A bride fell in love with the photos of a particular Bali clifftop villa. She had read a few great reviews from other brides who got married there before. So, she booked directly with the villa. She got a nice discount for her wedding, even though it was during peak season. All good, right ? Nope. What the villa failed to tell the bride was that during the time of her wedding there was a construction of another villa going on, right adjacent their clifftop villa. Not only had half of her wedding photos an ugly construction crane in the background, but also her wedding was affected by the noise of trucks coming and going to the construction site next door. Would our unfortunate bride have booked her wedding through a good planner that planner would have for sure alerted her to such a problem. I also heard of brides who were only told that the villa had a strict no-music-after-ten rule only after they had paid the deposit for the villa. Or the worst case that was brought to my attention was of a couple who wanted to be ‘extra-clever’ and save money. They booked the villa without informing the villa that they plan to have a wedding there. Photographer, makeup & hair they booked themselves. One of their guests was to be the ministrant and the bride self-organized some flower décor for the ceremony. As for the dinner and reception the plan was to go out and do that in a restaurant outside the villa. That way the couple wanted to save on the obligatory function fee that applies for the villa, the village tax, fees for wedding planner and other costs which our ‘clever’ bride wanted to avoid. After the ceremony when the couple and their guests wanted to leave for the restaurant where the reception was to be held the local villagers had blocked the road demanding the village tax. The villa management was also angry because the bride did not want to pay the function fee that applies for events in a villa. So, the villa management colluded with the villagers and blocked the road so that cars could not leave. Ladies, Gents, that brings me to the end of this article. 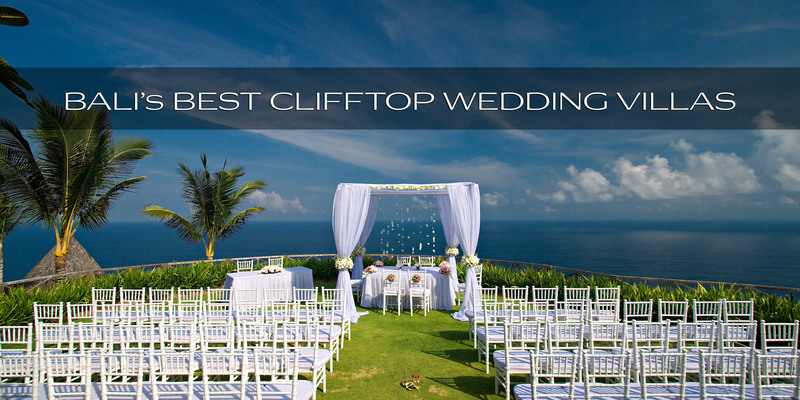 I hope you have learned a few things about the best clifftop wedding villas in Bali. 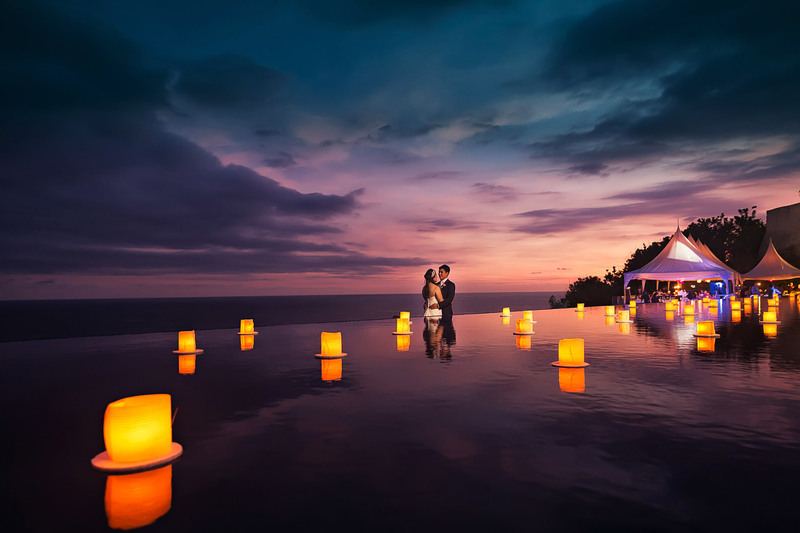 If you want me to send you some packages / quotes or someone from the SOCIETY OF BALI WEDDING PROFESSIONALS to help you with your dream wedding in one of Bali’s most spectacular clifftop wedding villas then please press the button below. For this who want to contact a planner direcrtly I recommend you go to EASY BALI WEDDINGS - Bali's most popular planner for tailored- made villa weddings. Also, if you have any questions or comments regarding this article feel free to leave a comment below. Bali Villa weddings – cheaper than you thought ! 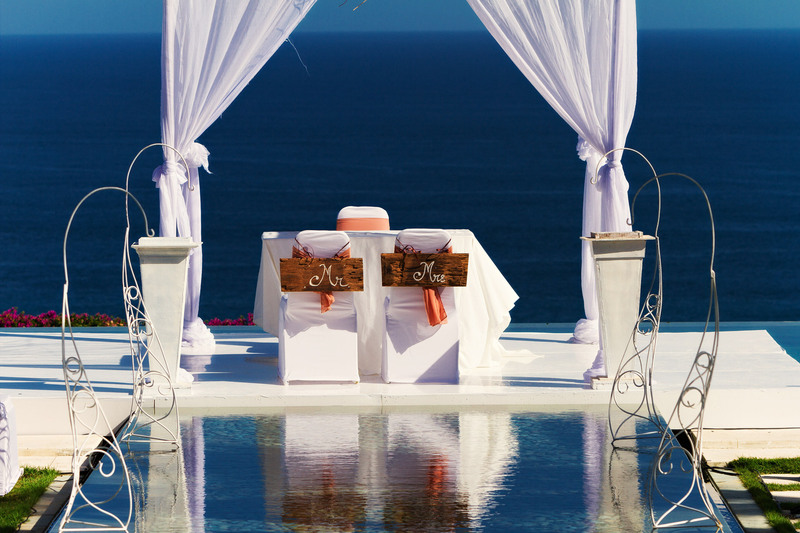 For many couples the ultimate dream is a villa wedding. 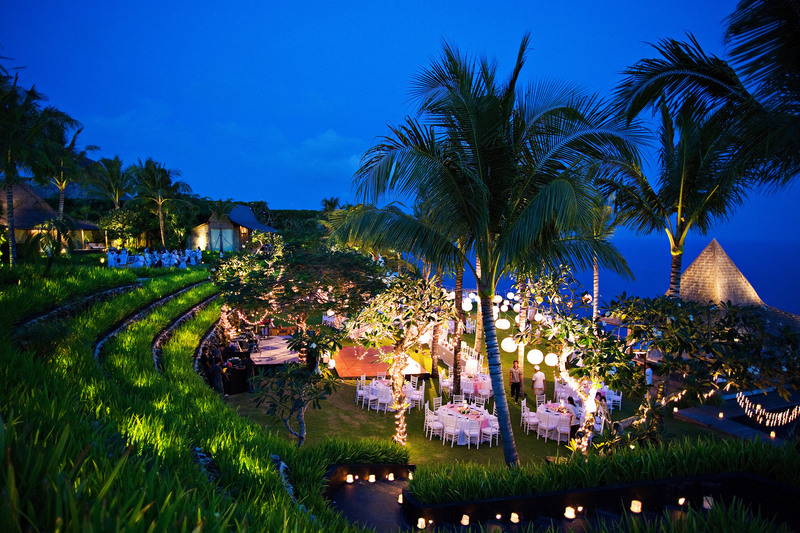 And indeed Bali villa weddings tend to be the most spectacular ones. However, there is a lot of confusion about what such a villa wedding costs. And that is exactly what I am going explain to you in this article. 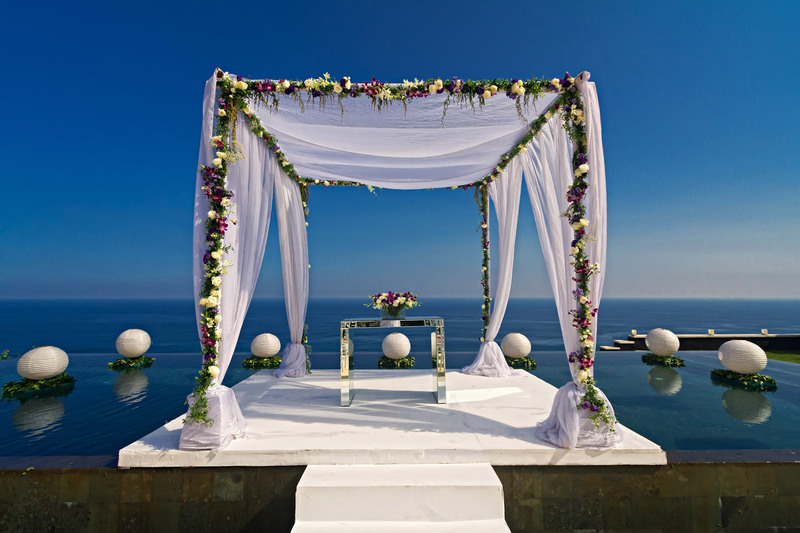 What should I expect to budget for a luxurious Bali wedding? 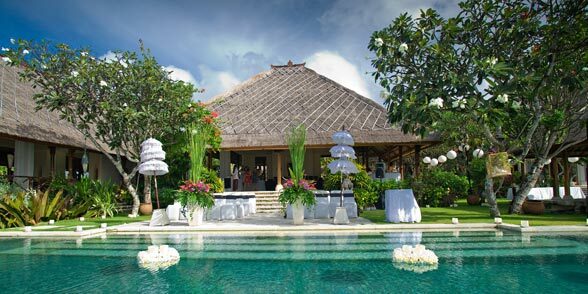 Many brides dream of a luxurious wedding in one of Bali's spectacular villas. And of course the question on top of their mind is: How much will this cost ? In this article I am going to explain to you the costs and other related aspects. Thank you so much. We already emailed you with the requested infos. Your article has been a tremendous help! I have a couple more questions, I was hoping to get your advises in. 1. If the hotel/ resort includes an wedding planner is their services, should we still look for another wedding planner? 2. 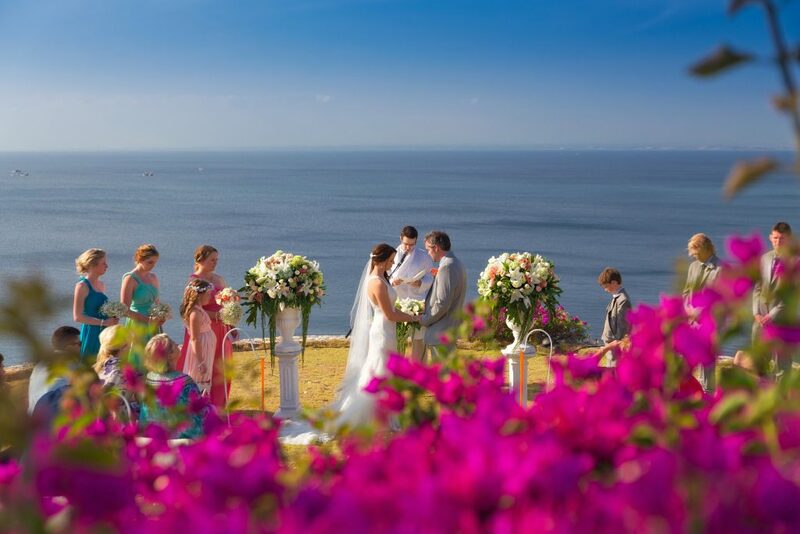 Could you tell me the name of the hotel/villa of the following pictures in this article?, Best Clifftop Wedding in Bali (https://baliweddingblog.com/best-clifftop-wedding-villas-bali/)? –	“Let’s get this party started….” – first picture in the article. Thank you so much – we already contacted you over email. Cliff venue that can host 100 guests. Any recommendations?